From the Microbrasserie Charlevoix, I have had a few of their Vache Folle products now, as well as their Triple and Blanche. Time for the Double! Very little light makes it through this deep, reddish-brown beer. The head is quite tall and impressive initially, and starts breaking down with gaps and bubbles within it, looking creamy and sturdy. However, it falls much quicker than you'd think, leaving nothing on the glass. In the aroma are mostly figs & raisins. The advertised spice / star anise comes out as a hint of licorice. A bit of alcohol surfaces, too. In the flavour is a bit more of the fig and raisin, perhaps a bit of brown sugar and taffy. A bit of the 8% alcohol also sneaks in here. The bottle advertises the mouthfeel as "rich, nearly full". I would say this is on the light side of medium - almost watery at moments. There's almost nothing full and chewy about this one. The finish does have a bit of stickiness, but a bit of heat from the alcohol comes out in the finish as well, distracting and detracting from it. I thought the Triple and Blanche in the Dominus Vobiscum series were pretty great. 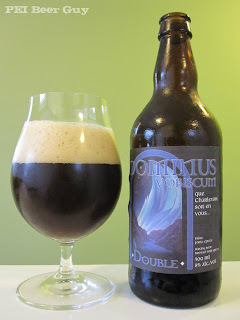 While this Double isn't a bad beer, it doesn't stack up to the quality of the other two I have tried - I'd try them again, whereas I would only try this again if it were really fresh or on tap.